Magasin 3 Stockholm Konsthall is opening the spring season on January 23 with a young Brazilian artist. Maria Nepomuceno allows her sculptures to spread across the exhibition space like vegetation in a mysterious garden. She uses rope and necklaces as raw material for her work, letting them take on their natural spiral form. For Nepomuceno the metaphor for the body and nature is central. She describes rope as a line, an umbilical cord, and every bead as a fertile point and a possible beginning that can be multiplied infinitely. 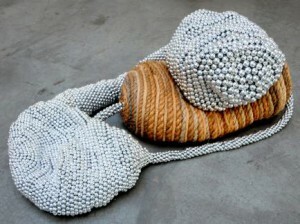 In one work a giant bead rests in a hammock while another sculpture is filled with thousands of small glittering beads. Every time she exhibits a sculpture she changes it and combines a part of it with another or takes it apart completely. Nepomuceno is inspired by ancient traditions and materials giving them new form and content. In Latin America hammocks are places of sleep, birth and death but the artist is also interested in the movement, the rocking motion. The artist will let her sculptural hammocks suspend across the exhibition space at Magasin 3. Maria Nepomuceno has re-worked existing sculptures and created new ones for the space. The exhibition at Magasin 3 is her second European solo show. She was born in 1976 and lives and works in Rio de Janeiro, Brazil. With a background in industrial design and art she has been actively exhibiting since 1999, most recently in her hometown at A Gentil Carioca (2009). Images: courtesy Maria Nepomuceno, detail from the exhibition "Esfera Dalva" at A Gentil Carioca, Rio de Janeiro. "Up in the Air "
Tom Friedman is known to many as the frustrated art student, who in 1988 emptied his studio of everything and painted it white, an artistic tabula rasa. This act was the catalyst which marked the beginning of a thriving artistic expression and formed the basis for a practice that has secured his stardom on the international art scene. ”Up in the Air”, 2010 - Mixed media. Installation view at Magasin 3 Stockholm Konsthall, February 2010. Photo: Christian Saltas. Courtesy the artist. Tom Friedman is an inquiring artist who follows his own precise logic and creates astonishing objects out of everyday materials. Like an alchemist he extracts the essentials of an object and then proceeds to turn the ordinary into something extraordinary. He tries to understand the world through his work and each new piece represents a new discovery; an artistic process that is playful as well as serious and intelligent. Magasin 3 Stockholm Konsthall is proud to present Tom Friedman’s first solo exhibition in Scandinavia. Specially for this show he has for the past year been producing a new piece entitled Up In The Air, which summarizes Friedman’s work and his artistic perspective on contemporary reality. In this comprehensive exhibition we will also be presenting key works from his production to the present day. Tom Friedman (born 1965) is an American conceptual artist, who had his major breakthrough in the early 1990’s. Since then he has won international critical and public acclaim and his career has been replete with solo exhibitions at spaces such as South London Gallery, Tomio Koyama Gallery, Tokyo, Fondazione Prada, Milan, the New Museum of Contemporary Art, New York, Museum of Contemporary Art, Chicago, as well as the São Paulo Biennale. combinations of four colors, using color ink washes. Color ink wash.
Sol LeWitt holds a special position within the group of prominent Minimalists and Conceptual artists that were so pioneering at the end of the 1960s and beginning of the 70s. He drew directly on a wall for the first time for an exhibition in 1968. For the remainder of his life he continued to work with what he termed wall drawings and investigated every line combination imaginable. Initially he restricted himself to horizontal, vertical and diagonal lines before expanding his geometric lexicon. Copied lines. The first drafter draws a not straight vertical line as long as possible. The second drafter draws a line next to the first one, trying to copy it. The third drafter does the same, as do as many drafters as possible. Then the first drafter, followed by the others, copies the last line drawn until both ends of the wall are reached. Pencil. The exhibition at Magasin 3 comprises works that like an artistic grammar focuses on his use of lines, that are visually chaotic, that emphasize the architecture and that are seductive color spectra. The artist is quoted as saying, ”every door is a wall”. In the exhibition each work leads to the next and rather than the Renaissance notion of painting being a window onto the world, the wall drawings are doors that lead the viewer into a world of ideas. Four color composite/pencil. A wall is divided into four horizontal parts. In the top row are four equal divisions, each with lines in a different direction. In the second row, six double combinations; in the third row, four triple combinations; in the bottom row, all four combinations superimposed. The American artist Sol LeWitt was born in 1928 and died in 2007. A number of retrospective exhibitions focusing on his wall drawings have taken place in the USA since 2000, most notably at the San Francisco Museum of Modern Art (2000), Dia Beacon, New York (2009) and Massachusetts Museum of Contemporary Art (2008-2033). In Europe the Stedelijk Museum in Amsterdam presented a retrospective with LeWitt’s wall drawings in 1984.